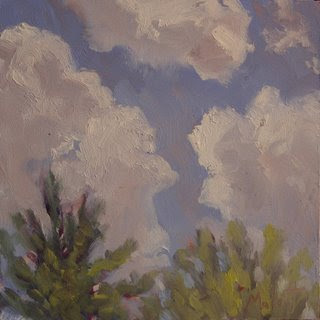 6"x6" oil on masonite. "From my Backyard" The kids are out of school for summer, yeah! We have already been "fun" busy with baseball, swimming, a little camping, the drive in theater. I am hoping to stay disciplined with getting at least one little painting done 5 days a week. I will get up early and paint before the kids are up or while they are having breakfast or as I did today, painting from my backyard, while my daughter plays with a friend. love it and admire your discipline.